Distinctive Unit Insignia. Description: A gold color metal and enamel device 1 1/8 inches (2.86 cm) in width consisting of a gold color metal segment of a Korean Castle wall, with a red roof overall two gold color metal tridents pilewise, from each a red streamer flowing outward. Centered on the device is a green chameleon palewise between two arched gold color metal scrolls inscribed "NEVER" on the dexter scroll and "DAUNTED" on the sinister scroll in red letters. Symbolism: The Korean Castle commemorates the organization's decorations awarded for services in Korea. The tridents allude to the Navy unit awards. The gold metal (yellow) and red on the castle and streamers refer to service in Vietnam. 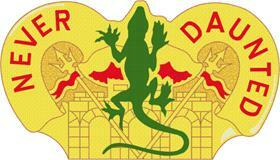 The chameleon, from the arms of the predecessor organization, perpetuates the history of the 84th Engineer Battalion. Background: The first design of the distinctive unit insignia was originally approved for the 84th Engineer Battalion on 20 August 1941. It was redesignated for the 84th Engineer Construction Battalion on 17 July 1953. It was redesignated for the 84th Engineer Battalion. A new design/the current design was approved for the 84th Engineer Battalion on 30 March 1967. Shield: Gules, on a pile terminating in an arrowhead Argent, fleury-counterfleury of six counterchanged, a Korean taeguk Proper, on a chief Or, a chameleon bendwise Vert. Crest: On a wreath of the colors Argent and Gules, upon three bars wavy of the first and Azure, a segment of a Korean castle wall with gate Or, roofed of the second, overall two tridents set pilewise Silver, from each a streamer flowing outward of the second. Shield: Red and white are the colors used for Engineers. The green chameleon and white pile, major heraldic charges on the coats of arms of the predecessor organizations, perpetuate the history of the 84th Engineer Battalion. The unit's six campaign honors awarded for service in Europe, World War II are represented by the fleurs-de-lis; the arrowhead at the point of the pile refers to the assault landing, Southern France. The taeguk symbol, from the flag of the Republic of Korea, refers to the battalion's campaign awards for service in that area. The red and yellow colors refer to service in Vietnam. Crest: The organization's decorations, all for Korea, are commemorated by the Korean castle gate, the tridents for the Navy unit awards, and the wavy bars for the Republic of Korea Presidential Unit Citation, Imjin River. The red and yellow colors refer to service in Vietnam. Background: The first design of the coat of arms was originally approved for the 84th Engineer Battalion on 8 October 1941. It was amended to correct the history on 27 February 1942. It was redesignated for the 84th Engineer Construction Battalion on 17 July 1953. It was redesignated for the 84th Engineer Battalion on 27 March 1956. A new design/the current design was approved for the 84th Engineer Battalion on 7 December 1966.